You can fit modern stereo systems, power antenna, CB radios, etc. to your pre-68 MGB if you change from positive to negative ground. This is easily done! First you must change your battery cables or clamps so they will fit on the opposite terminals. Leaving them disconnected, now reverse the positions of the two wires connected to your ignition coil. Next, the generator must be re-polarised. Disconnect both generator leads. Take a piece ot 14 gauge wire and attach it to the main "hot" terminal of your starter solenoid or to a "hot" terminal on your fuse block. Reconnect your batteries in the new configuration (with the negative post going to ground). Now remove the 14 gauge wire, and reconnect your generator leads. If your car has an ammeter or voltmeter, simply reverse their leads. Wiper and blower motors need no changes. Original pre-1968 SU fuel pumps are not polarity sensitive, but modern SU replacements are, and must be replaced with negative ground SU pumps. Thanks to Paul Hunt for clarifying the pump issue: "Later pumps with a Z in the prefix contain diode quenching of the contacts and will cook the wiring, if not the pump, if the polarity of the battery is reversed. The other indication is that the end cover is not stepped on these pumps whereas it is on earlier, non-diode, pumps. On the diode pump all you have to do is reverse the diode to convert from positive to negative, not replace the pump. Earlier pumps with capacitor suppression can be left as they are." In neither case do the wires have to be switched. You are now finished, unless you have a 1965-67 car with an electric tachometer. Step A: The wire in the "white wire loop" comes from the key switch and travels to the hot side of the of the coil. Referring to the illustration below, select one of the wires and tag it with two pieces for identification. Then, cut the wire between the pieces of tape, and cut the other wire to the same length. Reverse the connection (now there is one piece of tape on each wire) and splice (lineman's splice) and solder them (remember, this is the power lead for the coil and is unfused). You may want to use a piece of shrink-wrap tubing to completely seal the new connections and prevent corrosion. When later replacing the plastic block on the back of the tach, ensure that the metal band around the block is carefully positioned. This is a necessary part of the electromagnetic pickup. Step B: To reverse the power wire and earth wire inside the unit, it is necessary to remove the chrome ring, the glass face and the glare shroud. The chrome ring is usually removed with great difficulty by rotating until the tabs can fit through the slots in the case. Remove the two screws on the back of the unit that hold the internals to the case (not the two whose heads fit in holes in the case), and allow those internals to drop carefully into your hand. Don't bend the needle! The spade terminal is the power connection. Just next to this is the earth connection. A resistor is soldered to one of these connections, and a green wire to the other. Unsolder these ends of the green wire and the resistor from their current positions. Resolder the green wire to where the resistor was connected, and the resistor to where the green wire was connected. Reassemble the unit after cleaning the glass. Comments on "Negative Ground Conversion"
This worked perfectly, very easy to do and took about 10 minutes. Thanks a bunch!!! Brilliant, took ten minutes on a 62 MGB Roadster and now everything is working perfectly. I don't know if B tachs are the same as Midgets but I did the conversion on my '63 MK1 Midget and hope I did it right, here's a picture. I recently purchased my 67 B and I believe it was converted to negative earth more than 15 years ago. The Tach had not been working for YEARS. It took me all of 20 minutes to apply the fix. THANKS!!! I have just converted my 1967 MGB to negative earth/ground and installed an alternator. I have obtained a second hand negative earth tachometer which has two electrical inputs on the rear. One is a normal spade connector and the other looks as though it needs a female bullet connector attached to it. My existing positive earth tacho has a spade connector and the other connector has the "white wire loop" attached. Excuse my ignorance, but I assume I will need this white wire loop on the negative earth tacho - if so, how do I remove it from the existing positive earth tacho? I have a '67B and plan to convert it. I am surprised that I have not heard anything about changing the voltage regulator. A friend showed me a regualtor that had been modified with a jumper wire for such a conversion. What is going on? I have a newly restored 1965 MGB that has been switched to negative earth and will need to carry out the above tacho changes. I asked a specialist firm if they could do the work and they stated they would need to know the make of electronic ignition that be fitted and the coil. Do this items effect the above conversion or are they trying to fool me? Raul,Someone may have been into your tach before. On original tachs there is a green wire. Not sure i this helps, but take a look a page 14 of http://sunbeamalpine.org/wp-content/uploads/2017/10/alpine_tach_repair_rev5.pdf. 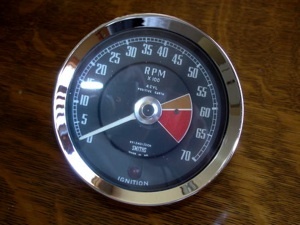 Although this is for an Alpine, the Tach is the same for MGBs. Lot of thanks Larry, I have just solved the problem. The problem was in one of the two transistor. I replaced the damaged and then the tacho runs now well.